Cardio and strength for every body. Fitness made affordable. Pay over time and enjoy 18 months promotional financing with your Bowflex™ Credit Card! 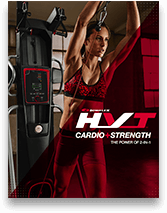 Request free info and discover how the Bowflex HVT machine can help you achieve the fit, lean, sculpted body you've always wanted.